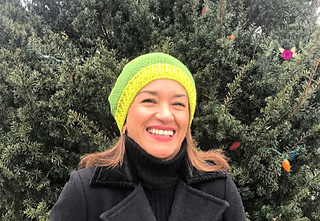 The Going Places Slouchy Hat is my contribution to the Make it for Me event and I just love it! I wanted to try my hand at Fair Isle crochet and Tapestry Crochet (did I learn they are different techniques used to achieve a similar design) and the end results were fun and challenging. Arrows point you in the direction you should go when navigating and going on a journey. The Going Places Slouchy Hat definitely suggests that you ARE going places… where? Well, that’s up to you! Where will you go? Where will 2019 take you? Where will you be on December 31st, 2019? Will you be the same person or will have you grown? Okay… a little too deep for a hat but I hope I conveyed a little about why I used arrows for this Going Places Slouchy Hat. Please note: This pattern is FREE on my blog but the PDF version is for $3. You can STILL view this pattern for free. FPhdc – Yarn over, insert hook around stitch of the previous row (row below), yarn over, pull up loop (3 loops on hook), yarn over, pull through all 3 loops. One FPhdc made. Sc2tog – Insert hook into st, pull up loop (2 loops on hook), insert hook into next st, pull up loop (3 loops on hook), yarn over, pull hook through all 3 loops. One sc2tog (or sc decrease) made. Ch1 does NOT count as a stitch. Skip ch1 and join to the first sc when joining. Always crochet your first sc in the same stitch. Keep your sc tension at an even tension. This will help your hat maintain the same gauge. This pattern will assume that you have some knowledge of switching colors in the middle of a row/round. Fair Isle Technique: When carrying your yarn, to create the arrows, you can do a Fair Isle technique by carrying your yarn BEHIND the stitches. Just be sure to leave enough give in the yarn so as to not make your hat tight. You will have yarn on the inside of your hat that will be seen. Tapestry Crochet Technique: Alternatively, you can use the Tapestry Crochet Technique, and carry your yarn through the stitches. If you do this, your yarn may peek through. If you do carry your yarn through the stitches, don’t pull your yarn too tight. Color changes instructions will be written as “In CA; In CB” this indicates that you should change colors. CA will be your main color or first color choice. Joining your chain – I cheated and made my first row of sc then joined. However, you can just make your chain, join and then do your first sc row. IF you join your chain BEFORE crocheting your sc row, you will need to chain one less than what’s called for. For sizes S/M, ch78, join and then sc 78 sts. For sizes L/XL, ch88, join and then sc 88 sts. The pattern is written in two different sizes, just scroll down for your size needed. For printing purposes, the sizes will be on different pages so you can print out just the size you need. There is also a color diagram to show you how many stitches needed to create your arrows. You also get a less slouchy version and a slouchier version. The pattern will indicate this. You can also add pom poms to your hats if you wish.